Today i bring you a new home, built for a challenge over at the TS3 forums. The challenge involved the building of a micro home on a 10x10 lot, quite a challenge in its self. There were rules and guidelines to follow (you can see the challenge here). So was inspired by the idea, i usually stay way from these sided lots as it is not my favourite size (I love 25x50, yes its odd, i know :P ).I am currently building another home with a similar architectural style so it was a little subliminal that it ended up with similar features. 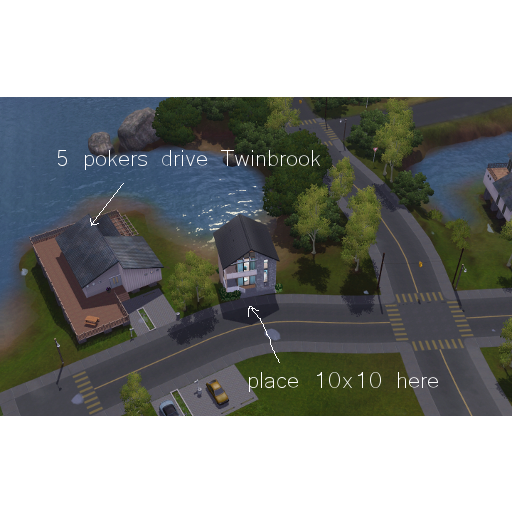 It was designed specifically for an area in Twinbrook. It is a custom placed lot but i will go through where that should be placed. Anyway here you go. I did also use the steel roofing from Aurora Skies but i took take out last minute but didn't take new photos as the other was very similar. as you can see, this is the placement of the lot, just on that little bend in the road. Now you don't have to place it here, but in order to maximize the use of the lower level, i would place it here, or somewhere with a similar slope to the ground. I know it is limiting, but not all lots can be multipurpose, the slope adds a challenge and interest to the build.